All three served their country in World War II. Only two came back. One gave me life. One gave me his daughter’s hand in marriage. And one…he died for you, me, and everybody else who thinks that freedom matters critically in the history of our world. 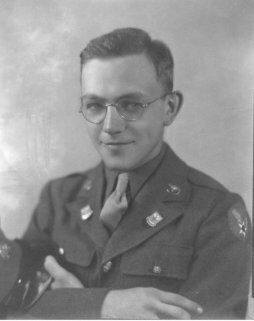 Frank W. Duntemann was attached to the AACS (Army Airways Communications System) and served first in Italy and then Africa. He claims that he slept through the bombardment of Monte Cassino, and having seen him sleep through my puppy Smoker’s biting his ear and drawing blood, I can almost believe it. 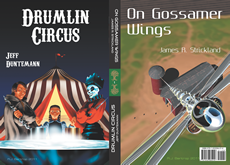 He sent Morse code on a Vibroplex bug, and could copy it in his head and pound it out on a typewriter as fast as anybody could send it. I could fill a book with the stories he told. 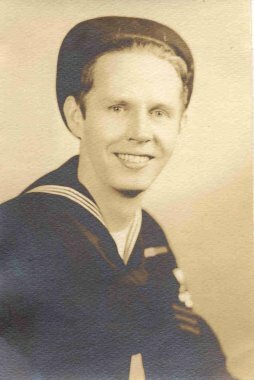 Steve Ostruszka was in the Navy, and served on the destroyer USS Woolsey (DD-437) until the War ended. Or so we think. Unlike my dad, Carol’s dad simply refused to talk about the War. Nearly all of what we know of his days as an engine mechanic on the Woolsey came from his brother Ed, who also served on the ship. Then there was Robert Williams, Jr. of Necedah, Wisconsin. He graduated from Necedah High School in 1942, and enlisted in the Navy immediately. At some point in 1942, he kissed his best girl good-bye, and got on a train for California to ship out on the Pacific. I don’t know what ship he was on, but at some point it was attacked by the Japanese, and sunk. His best girl was my mother. Like millions of other men and women in WWII and since, Bobby Williams gave his life to help ensure that others could keep theirs, and it was true of me in a very weird way. Absent his sacrifice, I wouldn’t be writing this. I wouldn’t “be” at all, which is a strange thing to meditate on. Now, the chain of contingencies leading to any individual life is long, and doesn’t end until the moment the genetic die is cast. Nonetheless, I wish that he had come back. He loved my mother, and no one should die so horrible a death at 19 or 20. I’ll go out and listen for taps tonight, and I will thank them again. I will thank countless others for what they gave and for the lives that were changed or lost altogether. We must go to war with the utmost reluctance, but having done so, we must honor those we send, in the hope that every war will be the last that our world will ever see. Outstanding Jeff! Best thing I have read this Memorial Day. went to the 50th anniversary 2 months after having lung cancer surgery and radiation treatments that ended right before. He wanted to go back to thank the boys that didn’t make back like your Mom’s first beau. God bless them all. As I walked the decks I realized that this was exactly the same kind of ship that my uncle Arthur Lampman road on the way to Europe and D-Day. He survived the landing but died in France a couple months later. The ship’s hold packed six high with infantry man bunks echoed the reality of his last weeks. Uncle Arthur was in the signal corps and died of wounds received while stringing cable to a forward artillery position. Just this weekend I was irritated at untangling cables under a desk. Shame on me. On a better note, the Jeremiah O’Brien is a wondrous place. I happened to visit on live steam day. That is the once-a-month when they fire up the boilers and turn the engines. The boy in me stood slack jawed at being a couple of feet from moving 10′ connecting rods and 4′ pistons. It was wildly unsafe and thoroughly astonishing. You can see this monster in action in the engine room scenes of the movie Titanic. Better yet, see it in person in a 110 degree engine room. Highly recommended. While you are in SF, visit the USS Hornet aircraft carrier anchored in Alameda as well. That was a very nice remembrance. Like Carol’s dad, my father would never talk about his wartime experiences. He served in the Pacific, and one of the few things I know (from the bits of his service record I could reconstruct, plus the various ribbons and insignia on his uniform, which I still possess) is that he was involved in the Battle of Luzon as a Technical Sergeant. My father was a friendly and plainspoken man, and I can only imagine what he must have seen, or had to do, in the Philippines that would make him avoid the subject for the rest of his life. Whenever I would raise the issue, he would simply say that our family had now done enough, then he’d extract the same promise from me every time – that I would not willingly join the military. Through my choices and sheer luck, I kept that promise. Now, every Memorial Day (and on many of the days in between), I think about the countless men and women who have been shipped to some far-off place they never heard of and experienced things I hope will never darken even my nightmares, all so that I can fret over carpet stains and inappropriate wrapping paper and the lack of a winning football team instead of invasion or foreign oppression. We can never truly know the price that they paid, whether they came home or not, but we owe them our eternal gratitude. Very well put together and wonderful and awesome at the same time. Thank you so much for writing this. I’m now thinking of my father and brother and my uncles who served. Mostly my dad who was on board a US Carrier. I don’t remember the name. Will have to ask him :). He might have been on a ship during the most hated war known as Viatnam, but any war is war and if they could be stopped all together it would be wonderful, but we know, that no matter what, another will pop up eventually. Jeff, that was beautiful. Thank you for sharing your thoughts and making my eyes water.